The theme for the current Lawn Fawnatics challenge is cards for guys. 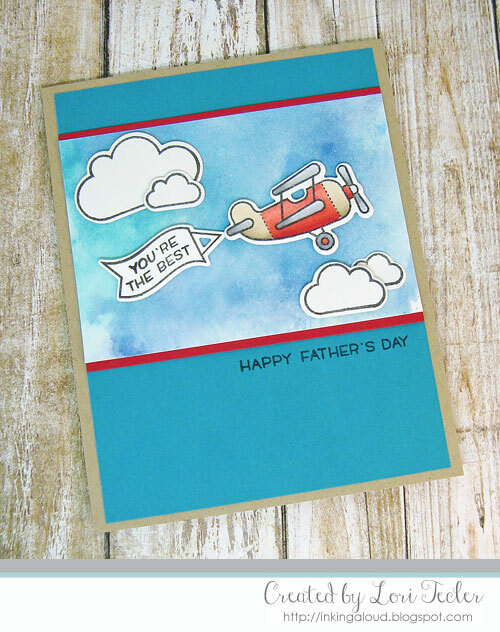 With Father's Day coming up this weekend, I took the opportunity to use my Lawn Fawn stamps to put together a card that's perfect for the occasion. I made a sky background using some distress oxides and water on water color paper. While the panel dried, I used Copic markers to color up the vintage plane from the Plane and Simple stamp set. I stamped the cloud and banner images, too, but didn't add any color to those. All of the stamped images were cut out with the matching dies. I arranged them on the now dry background panel, using foam tape on most of the images for dimension. The panel was edged with red cardstock to match the plane, then adhered to a teal cardstock panel. I stamped the "happy Father's Day" sentiment just beneath the bottom edge of my mini scene. The finished panel was adhered to a kraft card base.